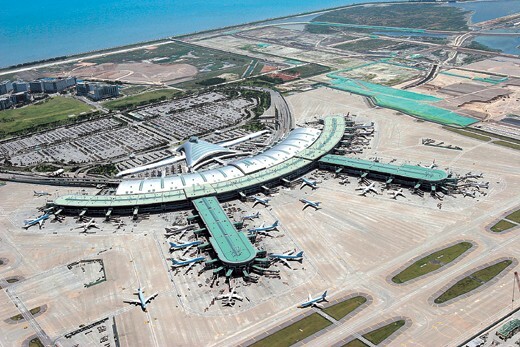 Let us begin with your arrival at the Incheon international airport (ICN). The following link shows you how the arrival procedures go. 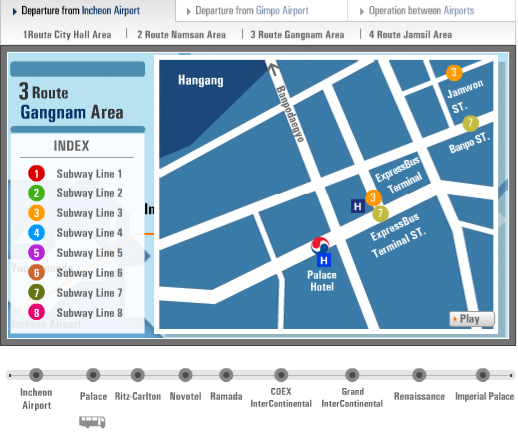 There are a few transportation options when you reach the COEX center from the airport. The most convenient choice is to take the non-stop limousine bus which we strongly recommend. After you pass the customs inspection area of the airport, you will see the exit gate and bus stops out the window. The limousine bus ticket to the KCAT (Korea City Airport Terminal) can be purchased either in cash or with major (VISA or Master) credit cards at the bus ticket booths for 14,000 KRW. You can also pay the fare in cash when getting on the bus. The locations of the booths are denoted by the orange colored dots on the map below. After you pass the exit gate, you will see a row of bus stops with gate number. Please go to the bus stop 4A or 10B and make sure the destination of the bus is KCAT. For the details, click here. Other public ground transportation as well as taxis can be found at the airport terminal. For more information click here and here. If your hotel is located in the Gangnam district, you would be better to take KAL limousine bus. It will bring you to the hotel lobby. You can also ride this bus to the conference site. For this purpose, get off the bus at the COEX intercontinential or Grand Intercontinental hotel. The following list is the hotels where KAL limousine stops. 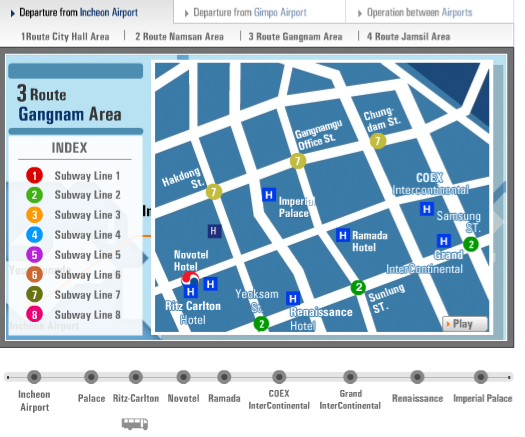 Here is some information on the KAL limousine bus to Gangnam area, Route 3.